I saw this three-minute video and smiled a lot, and decided I wanted to share it. It’s about a bunch of people who give free hugs. But what do free hugs have to do with ethics? Simply an application of the Golden Rule. 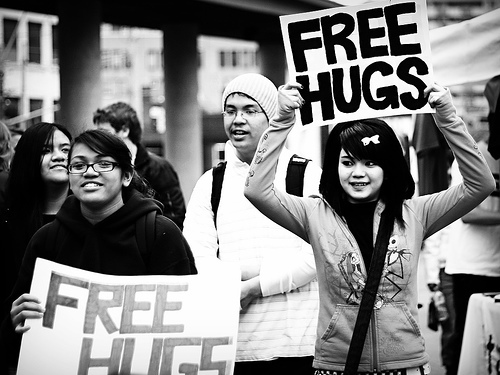 The freehug movement was started by someone who needed a hug so he offered to hug anyone else. Do unto others…But it’s also a statement for tolerance, for acceptance and love of strangers: For you were strangers in the land of Egypt (Exodus 23:9). A stranger shall thou not oppress; for you know the heart of a stranger, seeing you were strangers in the land of Egypt. This entry was posted on November 21, 2010 at 10:32 pm and is filed under Ethics-general, Religion, Tolerance. You can follow any responses to this entry through the RSS 2.0 feed. You can leave a response, or trackback from your own site. But You tube is not banned anymore, finally:) have seen a few videos of it…though I am not sure which is the one that you mentioned.